Driving into the bush in the middle of the Okavango Delta from Stanley’s Camp, we saw nothing. 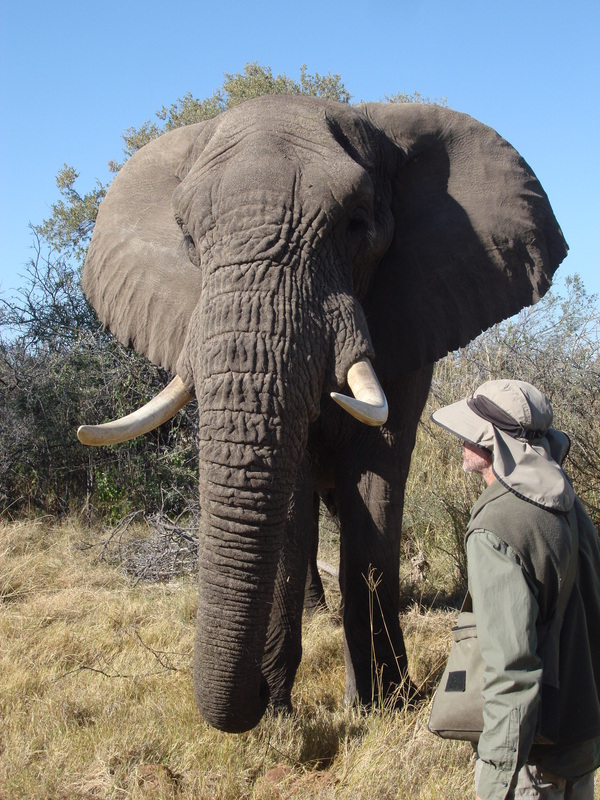 Lisa, a vet student studying in Botswana, came and took us for a walk in 2 ft. high grass until we came to 3 elephants just standing unleashed in the wild eating acacia tree leaves, grass and anything they could find. 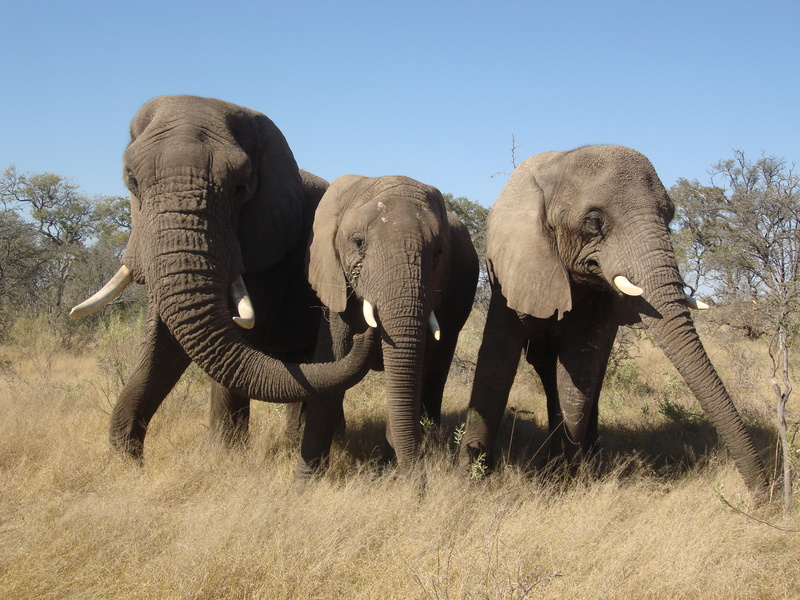 The elephants were Jabu, Marula, and Thembi, 1 male and 2 female. Jabu, the male, was at least 15 feet tall. The females were smaller and more “feminine”. All were orphans that were rescued from culling operations from their family herds. We stood as far away from them as we could and still be with our Abercrombie & Kent group. Doug Groves, the keeper of the elephants, introduced himself and the elephants as we stood in the grass spell bound and frightened. We were taking photos like mad and noticed our hands were shaking. Getting that close to wild, unleashed elephants just about freaked us out. Hyperventilating now, I was so scared but I didn’t want Jabu to figure it out. Elephants are very smart animals and can retaliate. Doug started teaching us about elephants that can live for 70 years. 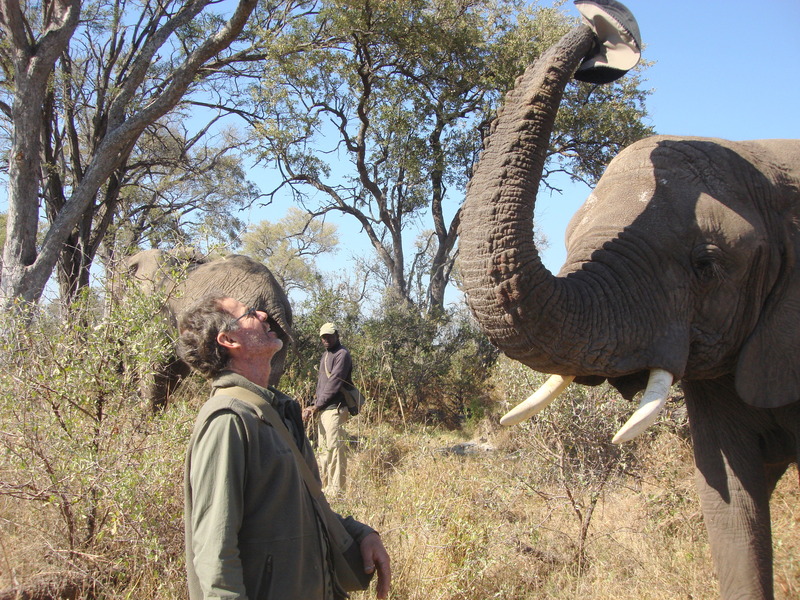 While shooting an American film involving elephants in the area in 1988, he became interested in elephants. With his wife, Sandy, they adopted Jabu, a 2-year-old, and formed Grey Matters for visitors to interact with his elephants and livingwithelephants.org to create harmony between elephants and people. They have devoted their lives to the elephants and can only be away for a day or two because they miss him so much. 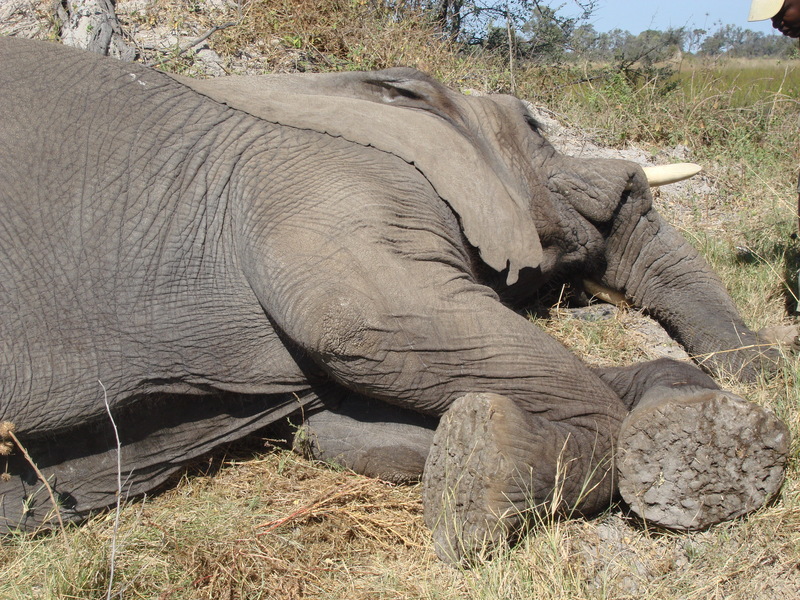 The 3 elephants have already saved his life in the bush when a lion went after Doug. The 3 elephants placed themselves between Doug and the lion and put their heads down to the ground. The lion backed off. Jabu is now 25 years old and his name comes from jaublani, which is Zulu tribe word for happiness. Jabu loves people and new challenges. Elephants do things with their sensitive trunk that is so exact it can pick up a pea, show alarm by blowing air through it, rumbling for communication, or for eating. 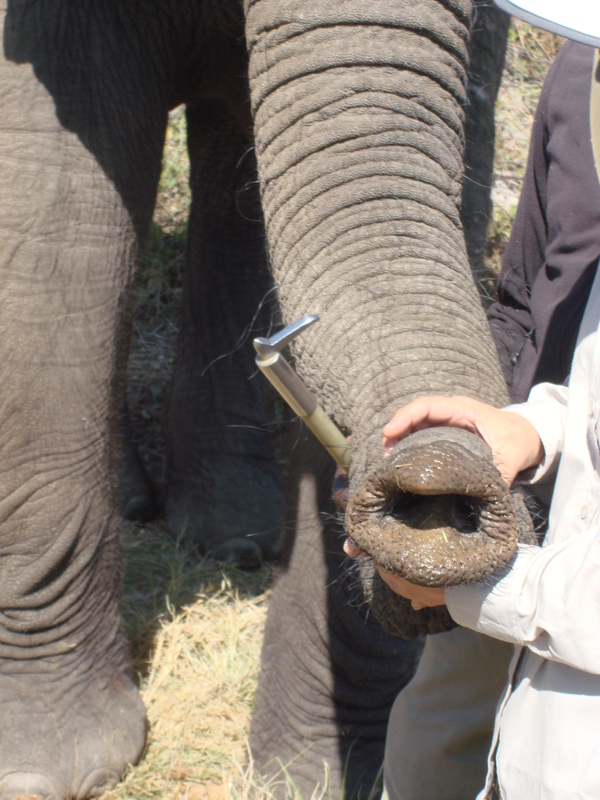 Then, Doug showed us a gland on the side of Jabu’s head that was draining between the eye and the ear. This shows the elephant is in musk and ready to mate. 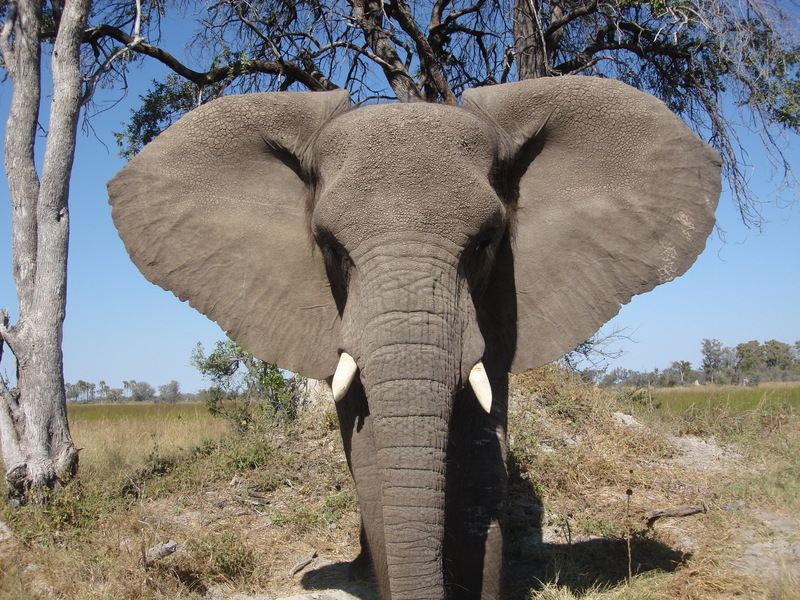 When the ear flap edge becomes torn and notched, it shows an elephant is older. One at a time, Doug invited us to greet Jabu and to touch his skin. He told us to only approach Jabu from the left side. 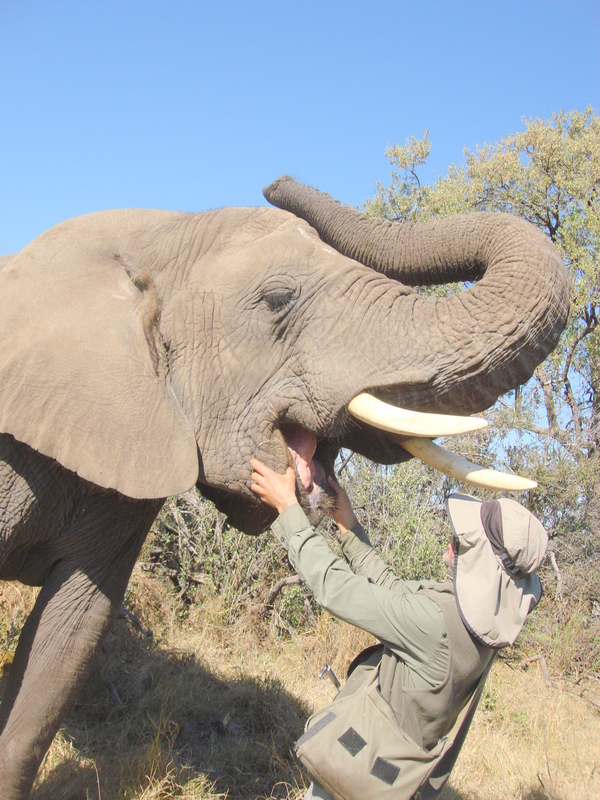 I have touched an elephant and knew what it felt like, so I decided to touch Jabu.. He had about 4-5-inch long hairs on his trunk which was hard to see as they were scattered evenly over the trunk. They act as antennas to indicate how close the trunk is to something. Shorter hairs are all over their body, but the hairs are every few inches apart. They are not like hair or fur, they are like wire. How Doug talked to Jabu amazed me. He talked so softly to him because elephants don’t like loud noises. Doug told Jabu to “come over here”to be closer to us about 5 times before he acted. But, from then on, he minded Doug on every command and worked like a perfect team. He never hit or hurt them in any way. He told Jabu to open his mouth and he did and Doug showed us his teeth and tongue. Then Doug told him to show us how he trumpets when he is alarmed and Jabu blew his trumpet sound so loud it scared me even further. Next he told him to make a rumbling sound which is how they communicate with each other and us, and he rumbled. Watching the 2 work together was just like a symphony and it helped me to warm up and be more comfortable around Jabu. Doug offered Jabu for photos holding onto his tusks and finally Tom agreed. The tusk is an extensionof the teeth-bone system. Next, Jabu showed us some of his hat snatching tricks. It was such a cute trick. So, everyone was offered the opportunity to do the trick with Jabu. By now, I was beginning to believe I could trust Jabu as Doug had showed us how to interact with him. 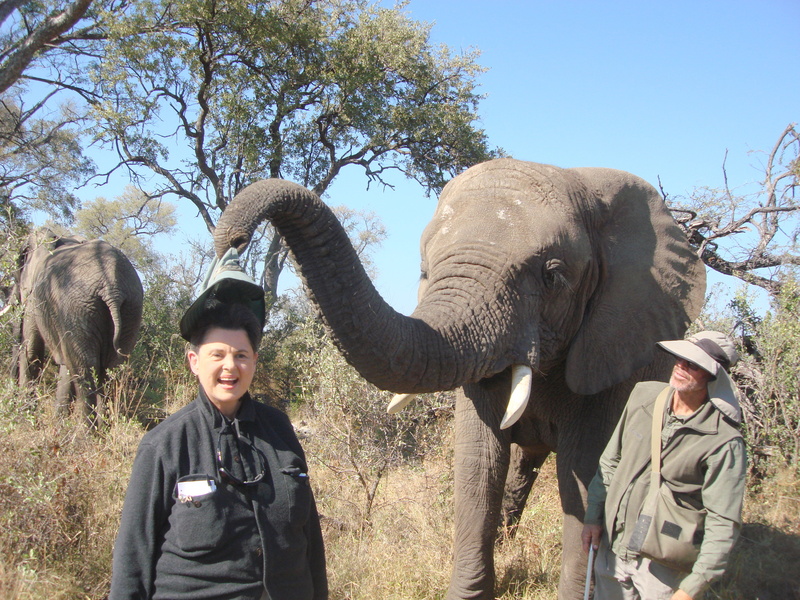 I offered so Jabu took off my safari hat with his trunk, put it on his head and then put it back on my head. His trunk was heavy as it bore down to put my hat back on my head! Marula was next to show her stuff while Jabu ate in the bush. 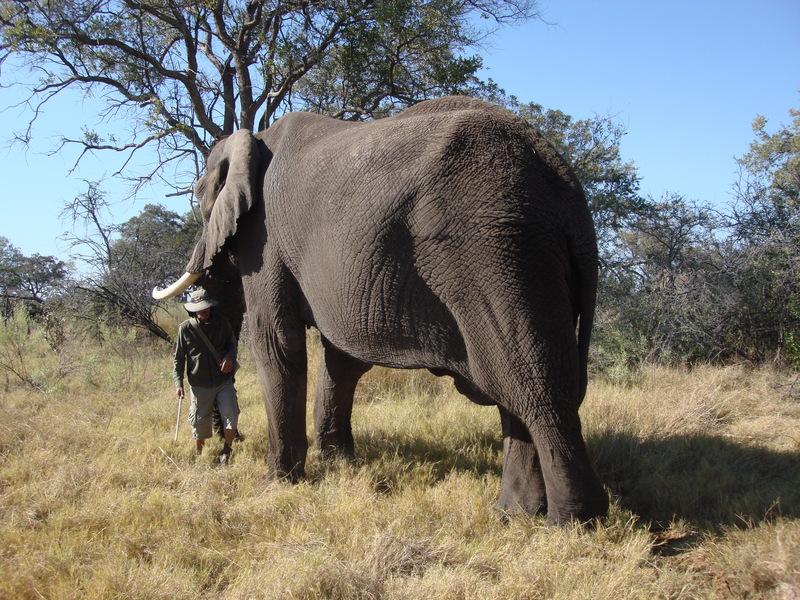 Marula and a male elephant were owned by a Botswana couple who got them from culling operations during the 1980s Zimbabwe drought. Meant to be pets to the couple, the male killed a man so he was sold to a park in South Africa. The Park owners decided the only solution was to destroy him after he killed 7 white rhino and flipped over a vehicle. Marula was not implicated in the rhinocide but she wasn’t happy and became antisocial. 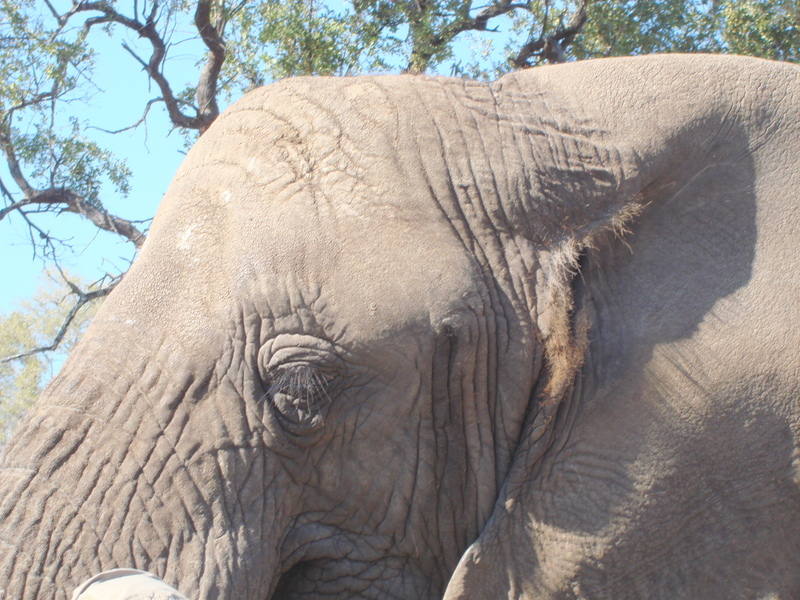 Doug took Marula in 1994, baggage, bad behaviors and all, and trained her and gave her a good life. She showed us some of her features like Jabu did. Doug said Marula is his Princess. Marula was taken to a small tree to eat. Elephants can eat everything on a tree—the bark, the limbs, the leaves-all of it. We watched them chew up entire large limbs like they were candy, and eat huge sections of grass like it was nothing. They can each drink up to 200 liters of water per day. Thembi was next and is the youngest of his 3 elephants. Orphaned in Krueger National Park in South Africa, Thembi is short for Thembigela, Zulu for “trust”. She is a sweetheart, and even though she is the smallest, she loves attention, loves to be with the other 2, and gets nervous when she is not. Thembi considers herself the protector of the herd. When he got her, she was lonely and not adjusted. She would tear up trees to take out her frustrations. Now with Doug, she has self respect, feels she belongs and is very sensitive. So Thembi had to show us how she sleeps each night and how she gets down and up. First it was the back legs that bent and it looked like she was sitting on her knees. Then it was the front legs that bent and she was down on the ground. The head and truck followed and she was totally laid out on the ground. 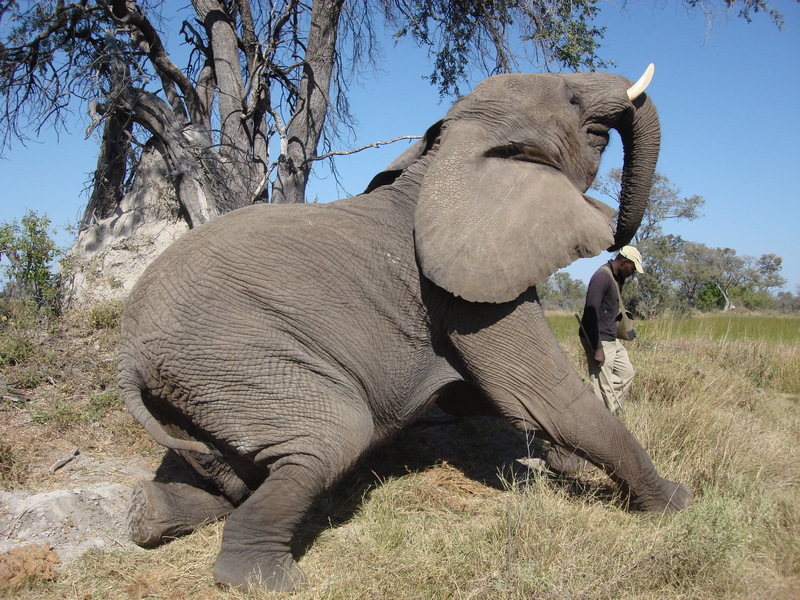 Elephants sleep about 5 hours each day and his 3 stay in an enclosure by his house there in Botswana. With Thembi totally laid out on the ground, he showed us her feet. It was our first time to actually see the bottom of a wild elephant’s foot and their toenails. Doug invited us to touch and inspect her foot. It was not smooth and kind of looked like cracked and dried mud caked on some parts and nothing on other parts. 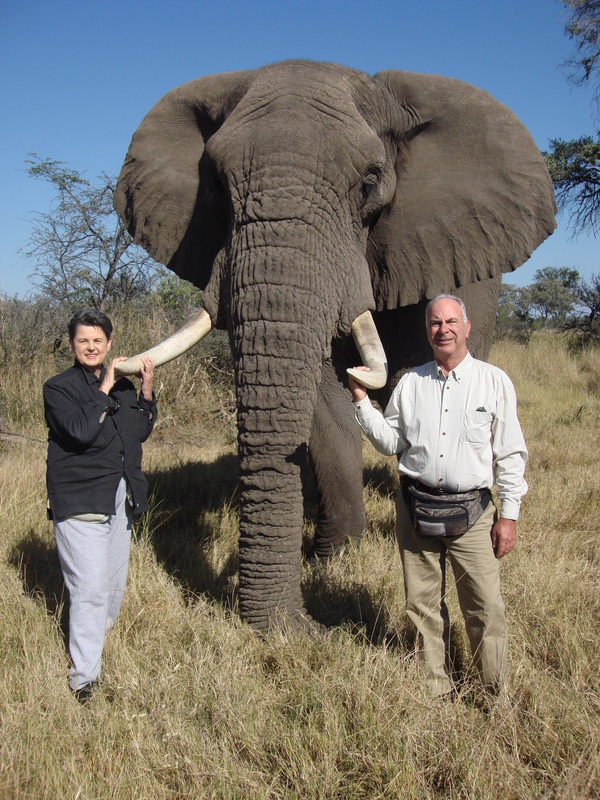 I had purchased a footprint of the elephant I rode (Damiano) in Zimbabwe, so that was the only “footprint” I had seen. Seeing an elephant lying down instead of standing tall and dominating over us all was an eye opener. After 2 hours, we left and the 3 elephants waved goodbye with their trunks. It was another priceless moment. And as we drove by them on the way to our bush lunch, Lisa was sitting on top of Jabu who had been taught to lift his right leg up so Lisa could get up and down. 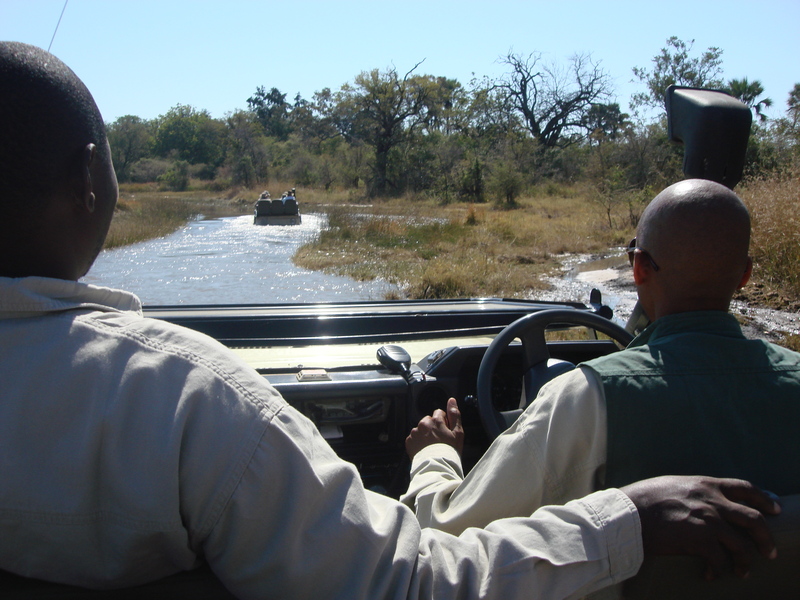 To get to the bush lunch, we had to “go swimming” in our safari Land Rover in the Okavango Delta which was 4-6 ft. deep and still rising in June. Stanley’s Camp provided us with a buffet lunch out in the wild bush underneath a mangosteen tree. While we were having pre-lunch cocktails, they joined us in our bush luncheon. in this magnificent event. 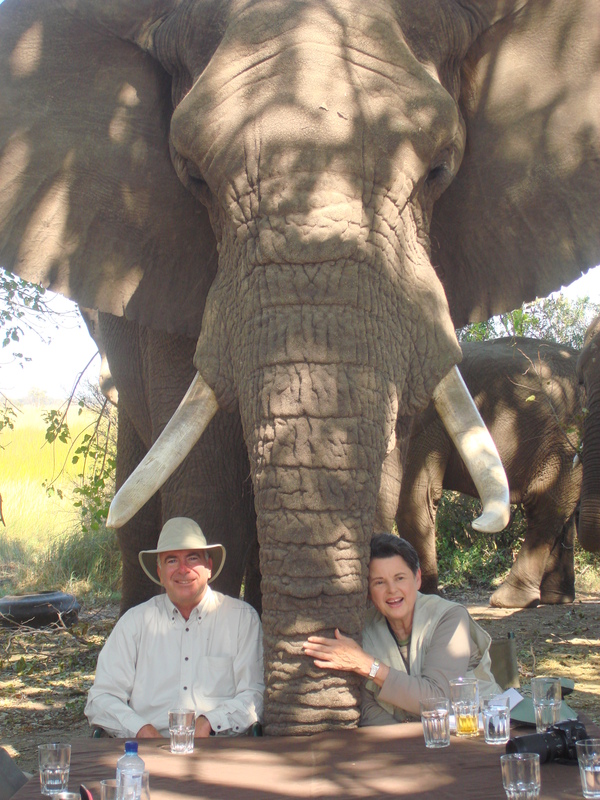 Never before had I ever had such a wonderful adventure with elephants, much less to have lunch with the elephants. It took a few moments to process what I had just seen and was experiencing. Workers brought in big blocks of hay and a plastic trash can with special pellets for each elephant. Their food was set in 3 separate piles just like our plates of food for each one of us. Doug stood by Jabu’s pellets for about 5 minutes while Marula and Thembi ate theirs because “if Jabu ate the pellets at the same time as the females, he would eat his fast and then go steal Marula’s and Thembi’s! And when all of us finished eating everything, the elephants just stood there perfectly while Doug answered our many questions. 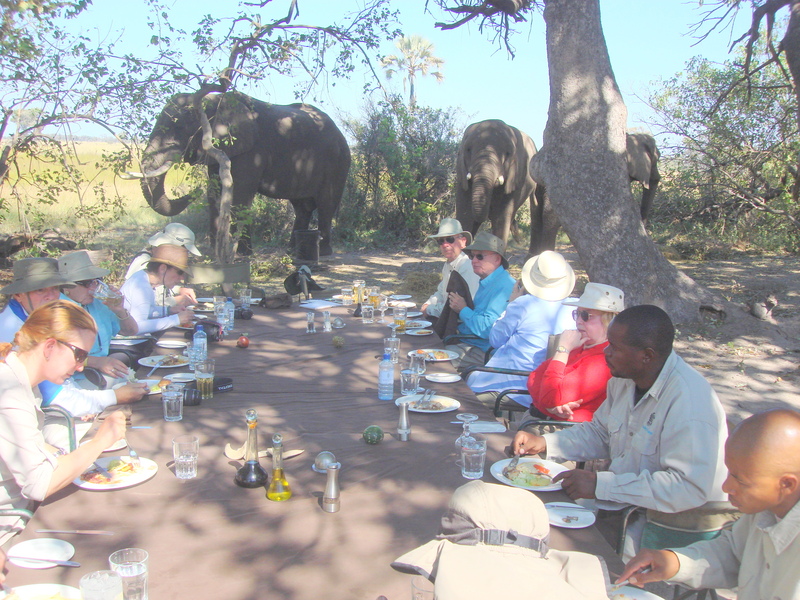 We were sitting at the end of the table closest to the elephants 15 feet away and we ate with them behind us. I trusted the elephants by now and felt comfortable enough to turn my back on them. Then, Lisa told us to move about one more foot apart and we didn’t know why. But soon we found out. All of a sudden, Jabu put his trunk between us. I just about lost my breath. Talking about a heart beating so fast, my blood pressure must have shot straight up! 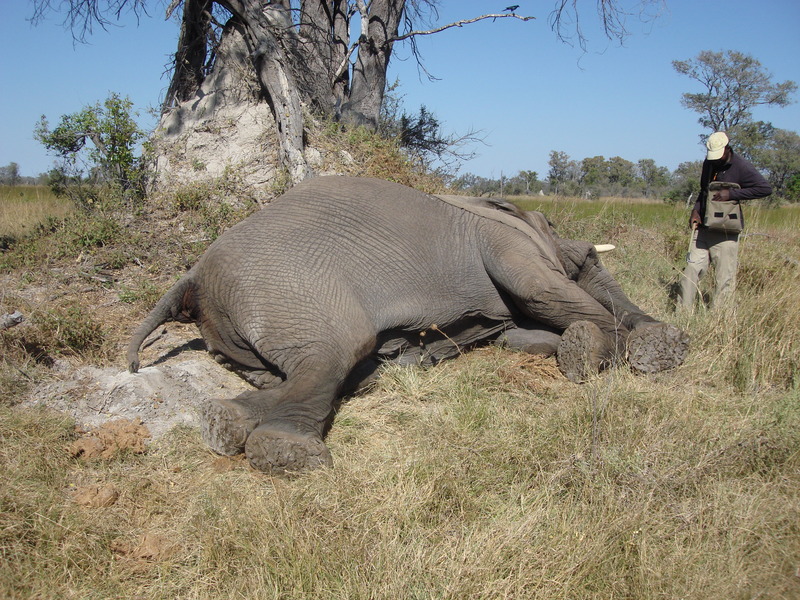 I could only think of the things that could go wrong at that moment and I began to write my headline again “Tow killed by bull elephant in Botswana.” The entire photo session with Jabu only lasted about 2 minutes but it seemed like an eternity to me. 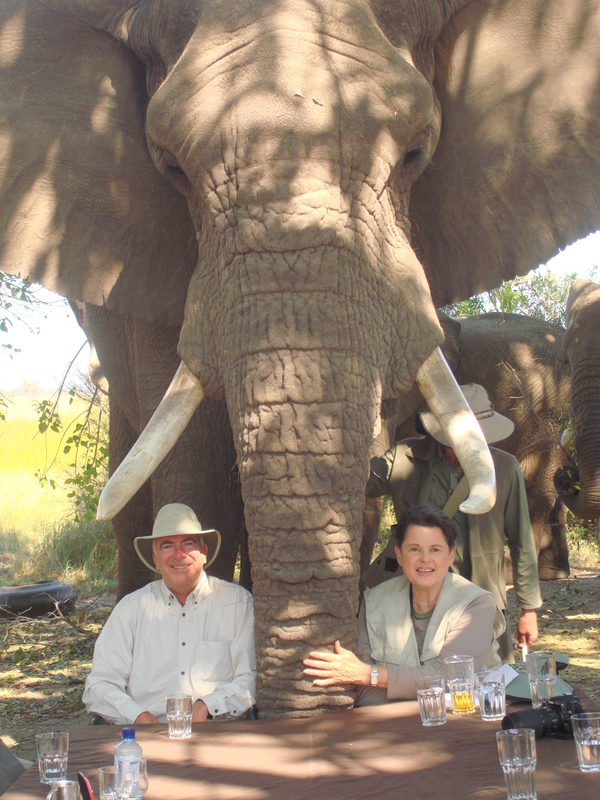 I was so relieved when he backed away yet I was so honored that Jabu would pose in a photo with us at the table and that we could experience this gentle giant and his 2 female friends. All 3 truly gave us a priceless moment that can’t be duplicated. As we left our bush lunch, the 3 elephants were waving “Goodbye” to us with their trunks!